Comet 204495A. "2 Pack" Comet Industries 204495A Clutch Shoes. Replaces: Comet 204495-A. Home > Comet Clutches and Parts > Comet 204495A. 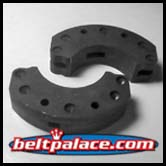 "2 Pack" Comet Industries 204495A, 3.5" Clutch Shoes. Replaces: Comet 204495-A. Comet 204495A. "2 Pack" Comet Industries 204495A, 3.5" Clutch Shoes. Replaces: Comet 204495-A. Comet 204495A. 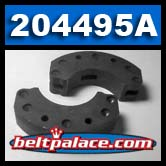 Package of 2 Comet Industries 204495A Clutch Shoes. 3.5" OEM Replacement drive clutch shoe for Comet Industries Clutch. Replaces: Comet 204495-A.